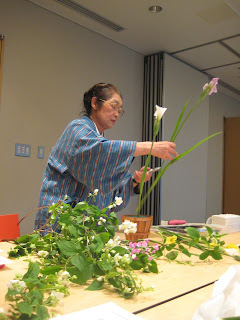 The teacher was a lovely Japanese lady called Mrs Matsudaira who deftly demonstrated the floral arrangement we were going to do in seconds flat. Irises were the main flowers used as they are traditionally associated with the boys festival that was just celebrated on 5th May. 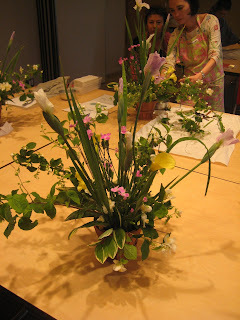 We also had white blossom, and some Pinks to add a bit of bright colour. With Ikebana, there are strict rules as to which angle the flowers have to be placed at and what lengths each flower has to be. Traditionally the flower arrangement was only seen from the front as it was placed on a tatami mat in front of a scroll painting in the Japanese home. But this one was a table arrangement , so had to look good from every angle. 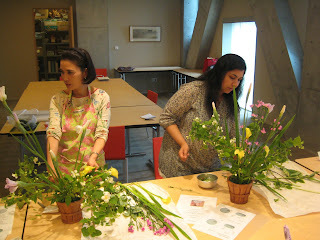 The teacher explained that you had to start with three flower stalks (the Irises) as the main points of interest. 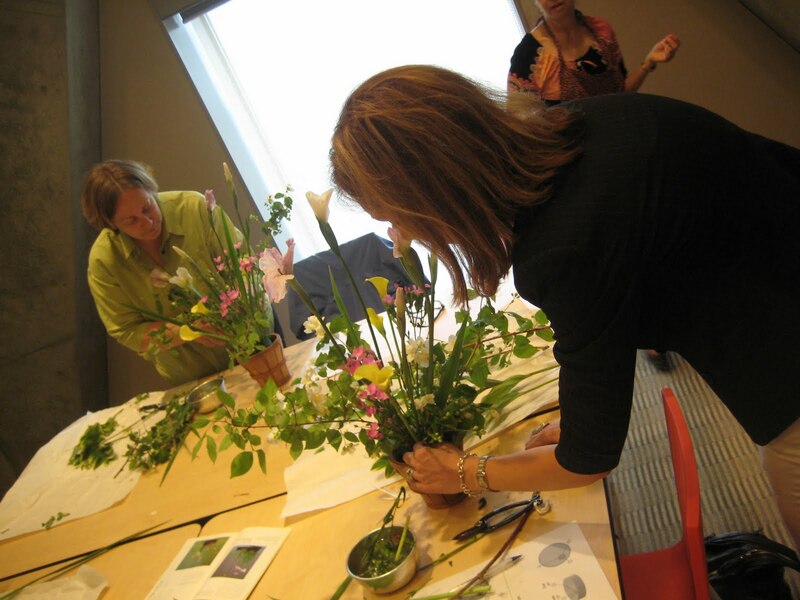 The flowers were placed in oasis and the first and longest one had to be facing out at 15 degrees, the second one was slightly shorter and at 45 degrees, and the third was the shortest and had to be at 75 degrees, all forming a triangle shape in the oasis. You could then fill your arrangement around these three stalks, using the other flowers and the leafy foliage provided, constantly turning the pot so that you made sure that it always looked good from every angle......mine didn't. I felt like I came home with a rather scrabby Easter basket, that looked even more sorry for itself once it had been on a journey through the rainy streets of Tokyo to home. I'm really glad I tried it out, but I think from now on I'll just admire the masters!